Georgian College’s Barrie Campus residence provides not only accommodations, but also a welcoming, safe environment where students can make friends, get involved, grow and develop. The residence houses 524 students in an eight-storey building overlooking the campus to the west and Little Lake to the north. 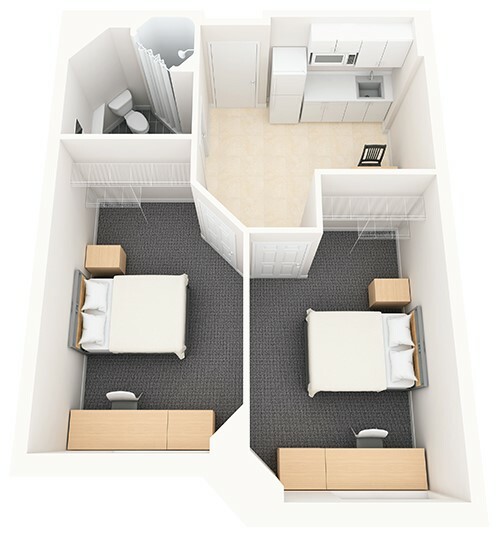 Most residence suites accommodate two students (except three three-bedroom suites) with each student having a private bedroom. All doors in the residence, including bedroom doors, are controlled by electronic key card access to assist in the safety and security of our residents. The Georgian College Barrie residence is professionally operated and managed by Campus Living Centres. Your suite comes fully furnished and features high speed wired internet access, TV with satellite television and telephone with free local calls. The residence is equipped with a laundry facility, common kitchen, common lounges (with varying amenities in each), and a front desk that is staffed 24 hours a day. Avoid a 12- month lease and pay only for the academic year (eight months). Live on campus and enjoy all college amenities (computer labs, library, cafeterias, etc.) – you are only steps away. Take part in the events hosted by your resident advisor (RA) and Residence Student Council or get involved as an RA or Residence Student Council team member yourself. Participate in the many clubs and committees on campus. Enjoy the comforts the residence provides with secure building access (swipe cards), 24-hour front desk and video surveillance in various areas of the building. Your residence fees provide you with a comprehensive accommodation package. You don’t have to worry about all the extras so you can focus your energy on your studies. When you live in residence, your fees cover your accommodation costs, internet, local phone service, all utilities, furnishings, appliances, etc. The only other costs would be if you required parking or if you decided to purchase a meal plan. Meal plans are available through Chartwells Food Services. Learn more about the meal plan. If you wish to purchase a meal plan, please email mealplan@georgiancollege.ca. The residence has dedicated parking on campus located right next to the residence and is available for an additional cost. No parking is allowed in the campus lots overnight with the exception of the residence parking lot. Residents may purchase a parking pass from the Georgian College Parking office. If you are unable to meet the payment options set out in your acceptance email, please contact applications@georgianresidence.ca to set up a payment plan. Stay connected with what is going on in residence through our Social Media, Monthly Newsletters and much more.